It was ages since I had a chance to sit down and write (ok ok no complains.. no excuses).. but I dont believe that anyone missed me so it’s fine ^.^ soo lets get down to business here. Some characters from the past..
Macross 7 is one of the huge bunch of Macross sequels.. But this one is actually really connected with the original series, as two of the characters of the original SDM are playing the big part in this one as well. Its Maximilian Jenius and Milia Fallyna Jenius – Max was a genius pilot, who married alien Milia and had a kid. Here they have a smaller girl named Mylene, who plays a big part. 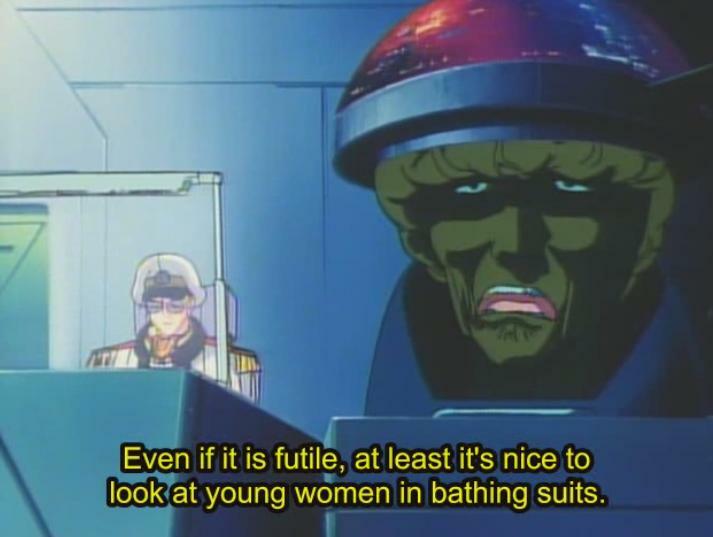 now 49 eps story short – all our main characters live in floating (in galaxy) city Macross 7, where strange activity of people loosing their spirits start to occur. 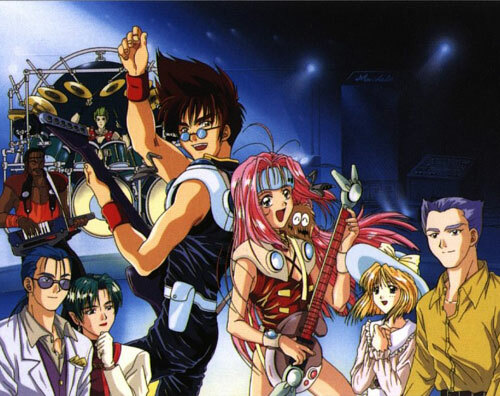 Also there is a band named Fire Bomber, which consists of Basara, Mylene, Ray and Veffidas. Now you wonder what a rock band has to do with all that – a lot. Apparently music plays a huge role in people having a lot of “Spiritia” which aliens are after. 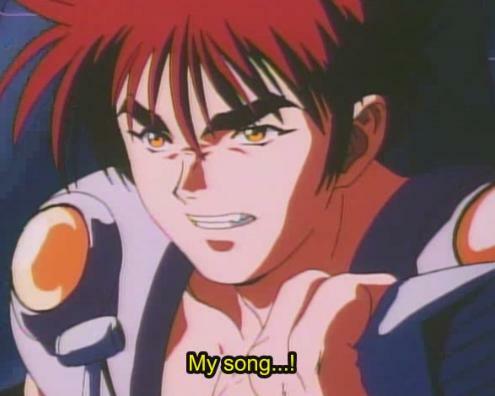 Basara on the other hand is determined to win against all enemies with his singing, he just wants to sing them to death.. Sounds crazy, but its not so.. 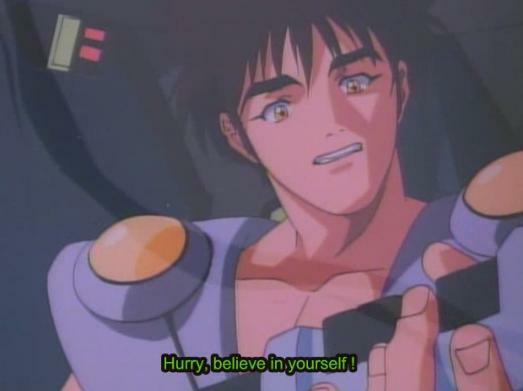 Eventually scientists discover that by singing Basara and his crew manages to break a hypnoses put on people by aliens and win against them. So I can tell ya – ohhh ya its crazy.. and sloooowwww.. thats why it takes 49 eps to roll it all out..
and Macross wouldn’t be Macross if there were no love drama.. this time its only one girl and two boys.. and one of them is not really sure about his feeling towards her. Its Mylene, Basara and Gamlin. 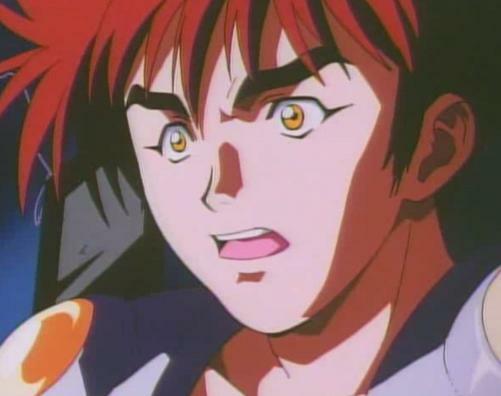 Though Basara is one of those cool guys, who plays as if he doesn’t care about the girl and only has his eye for guitar and plane, and his hart for music. But still he falls for a space girl as he sings his soul out to her. Mylene on the other hand runs after him a lot and probably without noticing actually feels deep emotions for him. But personally for me Gamlin is just one of the kind man. Though he is a solder and kills (and fights Basara a lot at first, because doesn’t understand his ways.. but thats just normal.. imagine you are a super solder and there appears some strange singing dude, who interferes with your work, doesn’t listen and just acts his own way.. that wasn’t really well explained.. ok imagine then a dude who just pops up in a middle of the fight and starts singing to an enemy.. ya really smart one, dont you think?.. 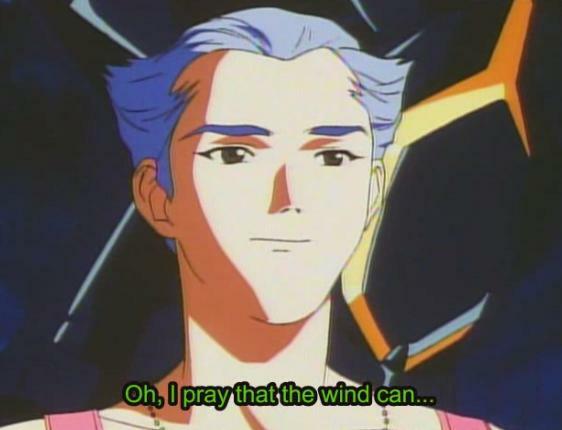 )..
so about Gamlin he eventually understands the way this anime goes (even if its absurd) and protects the band of his beloved Mylene. Mylene meets with him, because of her mother, but eventually becomes good friends with him.. And in my small opinion he acts really brave and cool as he tries to protect her and show his feelings.. But decision is not made in all anime, so triangle stays that way. what else to tell.. well a lot of stuff happens in this anime, but its not my intention to tell it all, or explain it.. but there is one more thing that couldn’t be left out.. Macross 7 wouldn’t have the name of Macross if there would be no music in it. And this one has a lot of it.. and really good of it..(and one more amazing video) It was probably the main (well maybe Gamlin also had some influence) reason I managed to finish this anime, because at some points it was a bit already off the track.. so if you need some good music you can try it out, but at the end maybe downloading (or finding on youtube) the soundtrack is a bit faster solution..
16ep. Ray and Akiko and Stephan and.. This entry was posted in Anime and tagged Ashi Productions, Haruhiko Mikimoto, Macross, Tetsuro Amino, [CA]. Bookmark the permalink.